Cool Roofs: An Economical and Environmentally Friendly Option! Traditional roofing materials absorb heat and allow the higher temperatures to seep into the building or living space beneath. Cool roofs have been designed to absorb less heat by reflecting the sunlight away from the structure and back into the atmosphere. 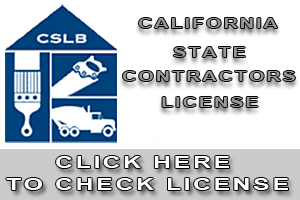 The process is becoming more popular in Southern California and can be accomplished through specially developed sheet coverings, or reflective paints, tiles and shingles. Virtually every type of building in warmer regions will benefit from this roofing technology. In much the same way that Southern California residents wear light colored clothing to keep cool on the hot summer days, cool roofing uses the principles of solar reflectance and thermal emittance to maintain lower roof temperatures. Even though there are many different combinations of roofing systems, the surface that is exposed to the most sun rays will regulate the overall temperature. Most new and existing structures can be made energy efficient through a number of different processes. Cool roof coatings are white or specially colored pigments that reflect sunlight. Coatings are thick paint-like substances applied by spray or brush to most roof types and protect the surface from ultraviolet light and chemical damage. Some coatings also offer moisture protection and restorative properties. Transforming existing roofs into cool roofs may include coating or recovering the surface with a waterproof and reflective material. If the existing roof is in need of serious repair, it may be retrofitted or completely replaced with reflective materials. Single-ply membranes: prefabricated sheets rolled onto the roof and attached with mechanical fasteners, chemical adhesives, or weighted gravel or stone. Single-ply membranes can be made cool by reformulating or coating dark materials with a lighter, reflective coating. Apply a cool coating over existing dark asphalt emulsion coating. Modified bitumen sheet membranes: at least one layer of plastic or rubber composite sealed with mineral granules or smooth finish; may be used to surface built-up roofs and is called a hybrid roof. Modified bitumen sheet membranes can be cooled when a factory cool roof coating is applied. Spray polyurethane foam roofs: reaction of two liquid chemicals that expands to create a solid surface and is applied to the roof. Foams must have a protective coating to avoid moisture and ultraviolet light damage. Polyurethane foam roofs are made cool when the reflective protective coating is applied. Shingle roofs: overlapping or interlocking composites of fiberglass, wood, metals, asphalt, or polymers. Cool shingles contain reflective enzymes, standard shingles can be factory pre-coated with a reflective sealant. Manufacturers recommend against coating non-treated existing asphalt shingles. Tile roofs: concrete, clay, or slate tiles that may be coated with custom colors or textures as well as waterproofing sealants. Tile roofs can be made cool by choosing light colors or applying a reflective coating. Metal roofs: variety of natural or painted finishes and some granular coated roofing. Metal surfaces are highly reflective but low in thermal emissions. They can be made reflective by applying reflective coatings or choosing a light colored paint. New homes can be constructed with cool roofing, often for little expense. Whether installing on new homes or when replacing existing worn roofs is not much higher than traditional roofing choices. In addition, cool roofing options have longer lifespans than their dark asphalt counterparts. 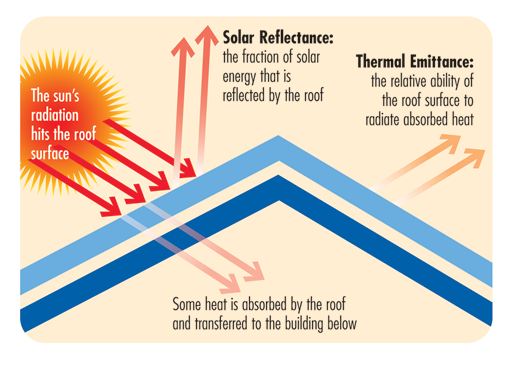 Climate is important because cool roofs are especially effective in warm, sunny temperatures. Existing Southern California homeowners should consider several factors to determine if the installation cost of cool roofing will be offset by the utility bill savings and any applicable rebates or incentives. For example, the amount of energy conserved will depend on the existing insulation and climate of the home, the type of roof and the efficiency of the HVAC units. Cool roof options offer a way for individuals to reduce their carbon footprint by reducing the number of greenhouse gases released into the air. These environmentally friendly materials also save money on air-conditioning costs and improve air quality. When enough are installed or replaced on a local scale, they can also lower temperatures across whole urban communities. Cool roofing not only makes sense but it saves money and helps the environment.